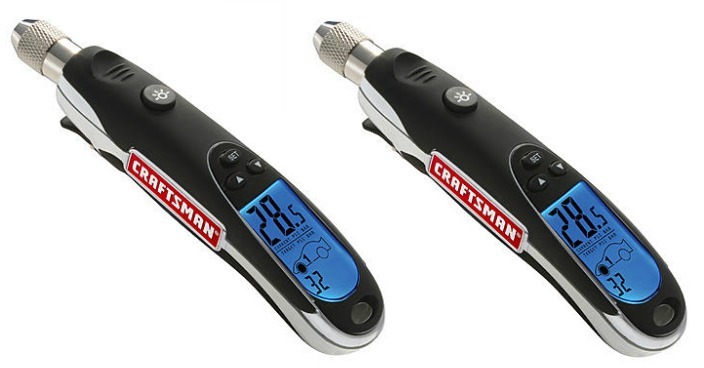 Craftsman Programmable Digital Tire Gauge Just $12.49! Down From $27! You are here: Home / Great Deals / Craftsman Programmable Digital Tire Gauge Just $12.49! Down From $27! Sears has this Craftsman Programmable Digital Tire Gauge on sale for just $12.49 (Reg. $27)! Please keep in mind that this offer is available for FREE in-store pickup only. Craftsman’s Programmable Tire Gauge makes it easy and convenient for you to check your tire pressure at any time. It’s important to keep your tires properly-inflated for more fuel efficiency, safer driving and longer durability. But it wasn’t always easy to tell if your tires have the right pressure… until now. This programmable digital tire gauge can be set with the target tire pressure for your specific vehicle and is designed to be easy to use. Just push in the nozzle to read, and the Air Bleed function will measure for exact pressure. A beep tells you when the gauge has locked in the pressure reading and you can take it out. The extra large backlight display is suitable for use at night, and it even handily converts to a white LED flashlight.